Dark streets, vile sewers, and twisting alleys; all home to the terrible criminals that control this city. Welcome to Rook City, where evil never sleeps. 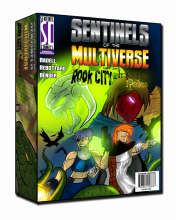 Ancient deities, extra-planar elder gods, and dark spirits threaten the very fabric of reality!